Christ Church Youth Year 12 School Leavers Trip! For over 25 years graduating students at Christ Church have enjoyed an exciting supervised alternative to the traditional school leavers holiday (schoolies). In 2019, Christ Church Youth will head to Fiji once more to be involved in a mix of service projects, home-stay and beach-side down-time. The trip promises to be filled with unforgettable experiences. Every school-leaver is welcome! $2095 including: all flights, accommodation, transport and food. *Early bird cost $1995. Available until 31 December 2018. With: The Fiji Trip is conducted in partnership with Youthworks Year 13 and Anglican Aid. Year 13 is a gap year programme for school leavers. 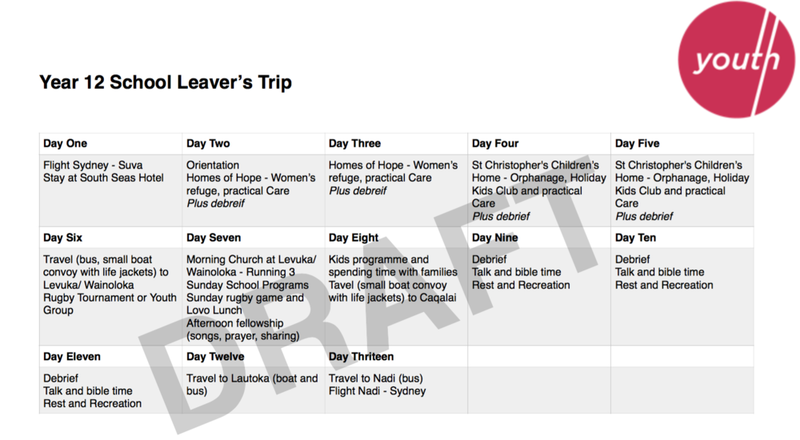 They have more than ten years of conducting extended trips to Fiji. The year 13 experience is a great opportunity for young people to travel, study, meet other young Christians and prepare themselves for the challenges of tertiary study. We commend their programme. You can find more information by visiting the Year 13 website HERE. Anglican Aid is the international charitable arm of the Anglican Diocese Sydney. From 2015 they are exploring ways to support sustainable aid projects in Fiji. We look forward to offering further support to their significant work. You can find more information by visiting the Anglican Aid website HERE. Why: Finishing Year Twelve is something to celebrate. 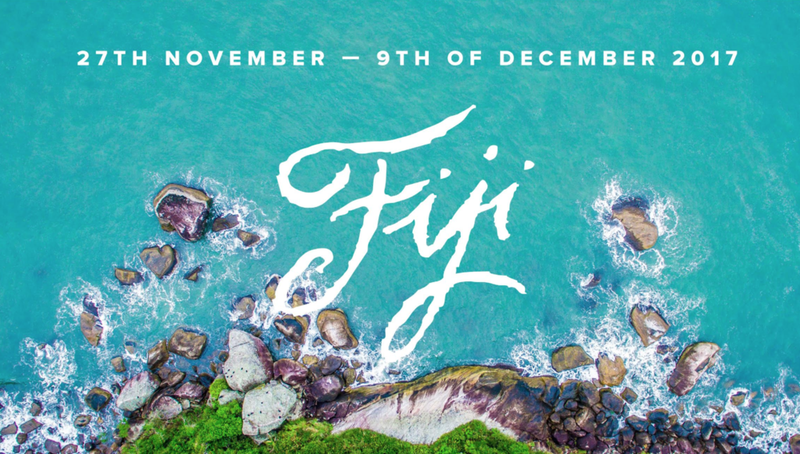 Our experience has been that the Fiji Trip offers a unique way to celebrate with unforgettable experiences, an opportunity to make a positive difference, all in a safe and supportive community. Jesus: As young adults making big decisions, the end of year twelve provides the perfect opportunity to reflect upon the big questions of life. Christ Church Youth believe that the answer to life big questions is Jesus. During our time away the group will benefit from Bible talks, prayer and lots of opportunity to chat and think. Christ Church Youth is committed to providing a safe space for people of all faith perspectives to consider the Christian gospel for themselves. See some photos and reflections from our 2017 students here. The long anticipated All Youth Social is here for 2019! We’ll be heading to Luna Park, eating dinner, enjoying the rides and the company of one another. PLEASE NOTE that not all youth will be able to enjoy all rides offered by Luna Park. They have a height restriction of 130cm on some rides. There are however a large amount of rides offered for those under 130cm. Ticketing costs will reflect this. Who: All youth in year 6-12. Drop off: Either 5:30pm at Werona Park, Gordon OR 6:30pm at Luna Park. Pick up: Junior High - 9pm at Luna Park, Senior High between 9-10pm at Luna Park. Registrations close at midnight, Sunday the 24th of March. We are looking forward to Year 6 spending some time to get to know each other. Our hope is that this adventure will provide an opportunity for the Year 6 students to grow in friendships with one another and their leaders. New friends are very very welcome. Price: $10 to cover our lunch together! Summer is coming and if you are in Year 7-12 in 2019, Summer Camp will definitely be the highlight! Camp is a great time to grow in friendships together, enjoy a mix of creative activities and down-time and to learn about God. Ian Millar, our Youth MTS apprentice, will be speaking to us from the Old Testament book Isaiah. For over 25 years graduating students at Christ Church have enjoyed an exciting supervised alternative to the traditional school leavers holiday (schoolies). In 2018, Christ Church Youth will head to Fiji once more to be involved in a mix of service projects, home-stay and beach-side down-time. The trip promises to be filled with unforgettable experiences. Every school-leaver is welcome! As the HSC approaches, the September holidays are the time to hit the books. But you don't have to do it alone! Come along to Year 12 Study Camp to spend 5 days studying 7 - 9 hours with AMAZING tutors, breaks with friends and time to hear from God's word. Location: Telford Youthworks Campsite, Port Hacking. Please note: due to term dates and public holidays we have moved from our usual location 'Blue Gum Lodge' to Telford for 2018. Everyone in years 6-12 is invited to join us for a night of adventures, food and friends!!! Bowling, Laser Tag, Pizza, Karaoke, Pool Tables & leader supervision included. Junior High Friday Fun Night! Celebrate the end of the year with us as we head over to a giant trampoline room! We will meet at Christ Church, have dinner, get on a coach to Flip Out together and spend a whole lot of time jumping around! For over 25 years graduating students at Christ Church have enjoyed an exciting supervised alternative to the traditional school leavers holiday (schoolies). In 2017, Christ Church Youth will head to Fiji once more to be involved in a mix of service projects, home-stay and beach-side down-time. The trip promises to be filled with unforgettable experiences. Every school-leaver is welcome! The trip will be fully supervised by Hayden, the Children's, Youth, and Families Minister, the Year 12 Leaders, and two representatives from Youthworks Year 13. What: The group will be involved in a range of experiences including serving in orphanages, prisons, women’s refuges, and at a theological college. Additionally, we will be enjoying local hospitality as we stay in groups with local Christian Fijian families. Finally, we will spend four days relaxing on the beach at our own private island. Cost: The cost for the Fiji Trip is $1995 (all inclusive). We would really like every year 12 student who wishes to come to Fiji to have that option, so if money is a concern for you and your family, please contact us if you would like to discuss alternative payment options. Where: We’ll be flying with Fiji Airways and spending the majority of our time on the East Coast, based out of Suva. Youth Winter Camps are coming up for Year 6 to Year 11 from Wednesday 12 to Sunday 16 July! This year’s Winter Camps will be a great time to get to know people, grow in fellowship with others, participate in a great range of activities and learn from God’s Word about Jesus’ Resurrection. Drop-Off & Pick-up: 1 Cowan Rd, St Ives — Drop-Off: 9am & Pick-Up 5pm. Meet our Junior High Winter Camp Speaker. Year 12 Big Day Out! Pick up: 8:30pm Christ Church St Ives, 1 Cowan road St Ives. Cost: $50, which includes zoo entry, leader supervision and all food. Please BYO opal card. Plan for the day: we will meet at Gordon Station, travel to the zoo together, enjoy seeing the animals and doing some fun activities, have lunch together and all watch the seal show! We will then travel back to Gordon station and onto Christ Church St Ives where we will enjoy dinner together and a time of sharing and encouraging one another. The evening will conclude at 8:30pm. On Friday 26 May we are running social weeks for our Growth Groups. The Leaders of each group have chosen an activity to suit their group. In most cases, unless otherwise specified, the socials will run for the normal Youth times. Therefore, Junior High will run from 6-8pm and Senior High will run from 6:30-8:30pm. Year 6 girls: Party & Games at the Church. Please bring $10 for dinner. Year 6 boys: Dinner & hangs at the Church. Please bring $10 for dinner. Year 7 girls: Cooking & hangs at the Church. Year 7 boys: Dinner & hangs at the Church. Please bring $10 for dinner. Year 8 girls: Baking & hangs at the church. Please bring $5 for baking supplies. Year 8 boys: Bowling & Pizza. Please click here for registration, all boys must be registered by Thursday 25 May. Year 9 girls & boys: Dinner & hangs at the Church. Please bring $10 for dinner. Year 10 girls & boys: Dinner & hangs at the Church. Please bring $5 for dinner. Rosie: meet at the church & then go and have dinner. Rosie will communicate where dinner is. Pippie: Dinner & Hangs at a house. Please bring $5 for dinner. Year 11 boys: Putt Putt at Thornleigh. Callum & Aidan will confirm details with the boys. Year 12 girls: will be having a dinner & hangs at a house. Please bring $10 for dinner. Year 12 boys: Dinner & hangs at a house. Please bring $10 for dinner. Christ Church Youth is going to Luna Park! Everyone in years 6-12 is invited to join us for a day of adventures, food and friends!!! Unlimited rides pass, morning tea, afternoon tea, lunch & leader supervision included. Pick up: Gordon station, 5pm. Bring: an Opal Card (with $2.50 credit). To celebrate all of Year 6 from 9.00 and 10.30 Church at Cowan Rd and 9.30 Family Church joining Junior High Youth, you’re invited to a Super Amazing Adventure Day! We will meet at the Church and have pizza for lunch! After that, we will be getting into teams and having a scavenger hunt around St Ives. Get ready for lots of fun and some friendly competition! Friends: We would love you to invite any and all of your friends to join us for Super Amazing Adventure Day! Years 6-12 and Parents are welcome to join us as we celebrate the year we have had together! Junior High is invited to celebrate the end of the year with us as we head over to a giant trampoline room! We will meet at Christ Church, have dinner, get a coach to Flip Out together, and spend a whole lot of time jumping around! On Friday the 25th of November years 6-12 will be gathering at Christ Church St Ives to celebrate the end of 2016 and the approach of Christmas with a Carols Service. Years 9-12 are invited to come and celebrate the year we have had together at Senior High and help raise money for the Year 12 School Leavers trip to Fiji as we set sail on a harbour cruise.